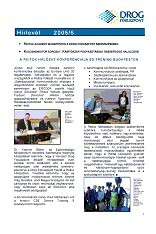 Monthly Newsletter of the Hungarian National Focal Point informs its subscribed readers about relevant news of drug monitoring systems on national and European level. The Hungarian National Focal Point is the national agency of the European drug information network. The NFP collects and processes data and information of other institutions and provides national and international organizations with them to help decision making on the exploration, treatment and solution of the drug problem. The NFP takes part in the European Monitoring Centre for Drugs and Drug Addiction’s (EMCDDA) work. It is the member of the Reitox Network of the focal points. In the frame of this network it yearly sends the needed data and reports to the EMCDDA. The NFP organizes, harmonizes and gives methodological support to the national data collection system on drugs. It proposes research topics on data collection and methodology to process them. Drugnet Europe, the EMCDDA’s newsletter, provides regular, rapid and succinct information on the Centre’s activities to a broad readership. There are four issues of Drugnet published per year. It is available in PDF and online formats. The newsletter carries regular features highlighting the work of the National focal points, European and international institutions, and relevant action taken under the presidencies of the European Union in the field of drugs. It is both an instrument of information (news) and a forum for communication between partners (exchange), and provides a complete overview of the work of the agency and its key partners.